Our nation is closing its chapter on the Long Wars as 2014 approaches. While there will be no single demarcation of when we become a “nation at peace”, we will settle into the same minimal focus and consciousness (if we are not there already) regarding Afghanistan as we did in Iraq when a no-fly zone was enforced for more than a decade following the Gulf War. I do not yet wish to comment on the national reflection that needs to take place, but in terms of military science I believe our introspection is flawed. Many studies and after action reviews have been undertaken examining generic trends or qualitative assessments, but very few have examined the input/output efficiencies that were or were not achieved by units, systems, and methods. It’s reasonable that such studies cannot be expected to be coldly objective in their analysis while active combat operations are ongoing. Never the less, there will be no “Victory over the Long War Day” which clearly marks the end of war and the start of peace, so a more robust critical analysis can not wait till there is no more emotion associated with our recent wars. Below are the least efficient input/output trends that I observed from my brief service in our Long War. These are my own, and derived only by my own anecdotal experience. A noble mission – but at what cost? 1.Counter-Improvised Explosive Devices (IED): By this I mean the big government counter-IED response, of which the Joint IED Defeat Organization (JIEDDO) is the prime example. This is an emotional topic for many, including myself, as friends of mine were killed by such devices – devices that are not new technologies that emerged in Iraq and Afghanistan, as many have portrayed them. The big government/higher headquarters response to Counter-IED might represent one of the worst returns on investment in annals of American war. When organizations such as JIEDDO consume vast swathes of money, the outlay is assumed to have achieved the effect of decreasing casualty incidents from such devices. However, such spending has actually had negligible results decreasing the harm caused to our forces. The past few years have seen millions more spent on high-tech counters to IEDs while the devices themselves are becoming cheaper and wounding or killing more of our forces. Anecdotally, for all the amazing technology I witnessed and/or used while in Afghanistan, solutions that were top-down or directed from high-level headquarters generally had much less impact on preventing casualties than those that were bottom-up. Fantastic technology had the same results as very basic know-how applied by 19-year-olds facing death, and contained decreased opportunity costs from draining huge coffers of money to address simple tactical problems. The data sets surrounding the issue are very difficult to comprehensively discern, as we are measuring the safety of our troops, and the spillover effects of some of the work taken by organizations like JIEDDO is likely large. But in aggregate it is hard to argue that we have not spun ourselves in circles looking for a technological answer to an eternal human problem of warfare. IEDs are, and will remain, a weapon that leverages a stronger force’s weaknesses against it. Planning to counter them in way that seems more in line with nuclear deterrence or research into ballistic missile defense seems to be a misplaced strategy. Historically there have been many examples of emerging technologies or tactics used by foes to exploit a gap in our own equipment or tactics, but we have traditionally let forces and commanders find the best way to meet those advances. Outsourcing much of the solution to large, bureaucratic organizations is not an “Occam’s Razor” solution. Money spent creating force fields more akin to Flash Gordon than Sgt Rock would have been better utilized providing realistic training for units, enabling commanders to address problems in their areas of operations according to their judgment, or, sadly the most radical suggestion for the DOD, saved for the rainy fiscal day that is upon us. 2. Growth in Networks: Inefficiency has also formed due to the gap between the vast growths in network capability of the U.S. military compared with its human processing ability. 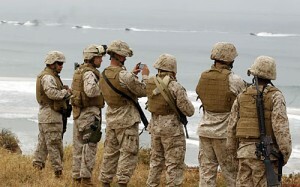 IT and communications technology allowed the U.S. military to enter into the Long War with an unparalleled ability to sense, collect, and distribute data. The largest problem is that our human processing ability – the capability to process such data into tangible and useful results – has not caught up. I was amazed as to what an infantry battalion in Afghanistan had at its disposal in terms of networks and databases, but disheartened when I tried to pull meaning out of those same networks and databases. Simply put, there has been a glut in the supply of information provided by networks and our cognitive demand has not caught up. Commanders are shown amazing examples and case studies of networks helping find a bad guys, save a patrol, or magically reveal what an insurgent will do. In all these examples it seems as if Apple designed our systems, and upon a few clicks of the mouse the answer will appear. Generally such outcomes occurred when there was a merging of the right person/people, events, knowledge, and required training. Such a confluence was a rare occurrence, and to raise expectations that they were common is irresponsible and shows expectation bias by allowing the cherry picking of results to justify larger, more complex systems. The most critical ingredients to cook up the perfect network-enabled operation – training and judgment – are the most difficult to inculcate in the 18-22-year-olds using the systems. It is true we need graduate-level thinking in our warriors to conduct counter-insurgency (COIN), but saying we need it and providing the time necessary to obtain it are two very different things. We can continue to build more intricate networks which add raw capability but little meaning to our command and control capabilities. I would argue the best network is not the most complex, but rather the simplest one that works the most consistently – a model our enemies seem adept at constructing. Increasing the training, judgment, and processing capacity of our forces will yield better results than expanding our digital tendrils past the point of diminishing returns of our collective nervous system. Revising our acquisitions process would help, often it seemed that new systems were shot out at the rate of how long it took a defense contractor to impress a flag officer instead an actual need occurring on the battlefield. A vetting system that involves more widespread testing at the lower ranks, and contracts which are easier to get out of if the product does not live up to expectations, could prevent debacles from seemingly simple requests that get turned into unstoppable hydras. 3. The Deification of COIN: I will preface this comment by saying that I am not a COIN naysayer who thinks that the U.S. military should only be prepared for larger force-on-force engagements a la Leyte Gulf or Kursk. I believe that the kit bag of any global power should be contain the forces necessary to interdict conflict at the low- and medium-ends of the spectrum, or before it begins. History proves that most of America’s wars have been low-intensity conflicts. That being said there has been a fetishization with COIN, and it more proportionally affects junior leaders like myself. COIN takes much skill, has a limited bandwidth of applicability, and will always be best when its strategy comes from those closest to its application. But such characteristics are not likely to apply if high-intensity conflicts occur. Our current rebalance to the Pacific is based on the likelihood for fast, large-scale, and highly violent conflict. Such a conflict will weigh heavily on junior leaders, but not in the way they are used to. They will have to rely on senior leadership to coordinate and enable their actions, because without strong, decisive higher headquarters guidance a danger of the second coming of Task Force Smith exists. While deployed in the hinterlands of Helmand, many lieutenants had to craft their own guidance and operate with the slimmest of intent. The vast majority did so well; they also came away from the experience rightly confident in their abilities and skeptical of the perspective higher headquarters had. In a vast ocean and littoral battlefield, those same independent operators will have to accept the fact they will not see the whole picture. Our forces have done extremely well fighting over long tours interspersed with moments of violence, but have had more limited exposure to highly kinetic battles that take place over months and require management of rates of fire, triage, and difficult decisions about weaponeering. Most of the choices were easy in a COIN fight, as the majority of the time the decision was always not how to use the most force but how to use the least. While the strong experiences that have been formed over the past ten years of small unit actions are priceless, it must not be treated as sacrosanct in all circumstances. Future junior leaders may not be in command of the lone patrol base for miles, or if they are, they might only be effective if they are aware of the fight going on at higher levels. We have rarely been able to choose our wars, and even when we do the enemy casts votes that are rarely predicted. Raising an officer corps to worship at the altar of COIN is no healthier than those who refused to accept COIN’s viability in the early stages of Iraq and Afghanistan. 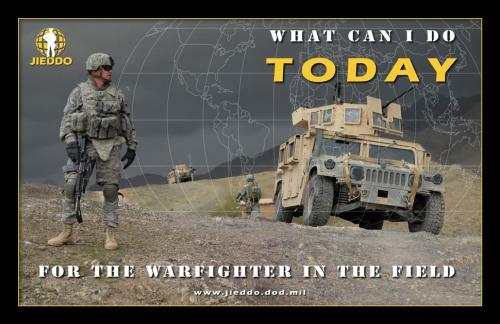 There are enormous amounts of knowledge to be extracted from the previous decade of war, and efforts to refine that knowledge into a powerful, efficient fuel that can power our military to train for future conflicts needs to occur as a logical study of our efficiencies. We have had many qualitative accounts of battles and campaigns that have aptly described what was or was not done. There have not been as many quantitative studies of what provided the most for the least cost. Such an examination will be boring, and necessarily ignorant of the emotional side of our conflicts, but is required as it will be best way to extract meaning that will be useful in future wars. About the Author: Chris Barber is a Captain in the United States Marine Corps. The views presented here are his own and not official policy of the USMC, DOD, or United States Government. They also are insanely clever for a gentlemen educated in public school that might not be able to spell COIN if not for spell check. This concept proposal explores a technology solution to the problem of risk to first responders when identifying, neutralizing, and exploiting “surface-floating” maritime improvised explosive devices (SF/MIEDs). Does the Navy need a maritime equivalent of the Talon Counter-IED robot? When considering the proliferation of technology for use against land-based improvised explosive devices (IEDs), it may be puzzling to many observers why remote IED Defeat (IEDD) technologies, particularly robots, have yet to fully cross over into the maritime domain. Although some unmanned underwater vehicle programs designed for limpet mine-like object detection on ships are in development, much less attention has been given to countering SF/MIEDs. In general, the purpose of MIEDs is to destroy, incapacitate, harass, divert, or distract targets such as ships, maritime critical infrastructure and key resources (CI/KR), and personnel. MIEDs may also present obstacles (real or perceived) with the purpose of area denial or egress denial. As a subset of the MIED family, the “surface-floating” MIED operates on the water’s surface in environments such as harbors, the littorals, the riparian, and the open ocean. It may be either free floating or self-propelled, with remote control (manual or pre-programmed) or with no control (moves with the current). It is a tempting low-tech, low-cost option for an adversary. Thankfully, SF/MIED incidents have been rare in recent times, the last significant use occurring during the Vietnam war. Nonetheless, a capability gap is highlighted by the challenge they represent—namely, that a human must unnecessarily expose themselves to the object. One material solution to a surface-floating IED may be to develop an IED Defeat Unmanned Surface Vessel (USV) around a design philosophy based on IEDD robots used in land warfare. Protection of high value units and critical infrastructure / key resources would be its primary missions along with counter-area denial. Its most likely operating environment would be CI/KR dense areas such as harbors and seaports as well as the riparian environment since rivers are constricted in the water space available to shipping to maneuver around SF/MIED threats. A key element of design philosophy in an IEDD USV would be to meet the expectations of the customer—the first responder. 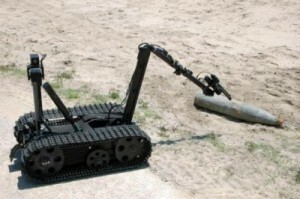 Military explosive ordnance disposal (EOD) units and civilian bomb squads are much more likely to accept a platform in which the console and all other human interface features are nearly identical in look, placement, feel, and responsiveness as the most popular robots they have been accustomed to operating such as the TALON robot by QinetiQ and Packbot by iRobot. A functional hierarchy could be drawn around major tasks such as reacquisition of a suspected surface-floating IED, identify/classify, threat removal, neutralization, and recovery of the IED for exploitation. Modularized payload packages to execute these tasks may include a towing package, an attachments package (e.g. hooks, magnets), a neutralization tool package to include both precision and general disruption EOD tools, an explosives, chemical, and radiological detection package, and an electronic counter-measures package. Official liaison between NAVSEA (US Naval Sea Systems Command) between PMS-406 (Unmanned Maritime Systems) and PMS-408 (EOD/CREW program) to ensure the transfer of USV expertise between PMS divisions. A DOTMLPF assessment to determine whether limpet mines or surface-floating IEDs are more likely and more dangerous to U.S. assets and personnel given the uncertainty of future naval operations. Including civilian bomb squads in the design and development process early to increase the potential for demand and cross-over with the law enforcement sector and therefore reduced long-term program costs. Current UUV programs under development include the Hull UUV Localization System (HULS) and Hovering Autonomous Underwater Vehicle (HAUV).